In the Spring/Summer catalog, CTMH has this cute set for $17.95. You can either color in the stamp as I did or paper piece it. Either way, it's darling. 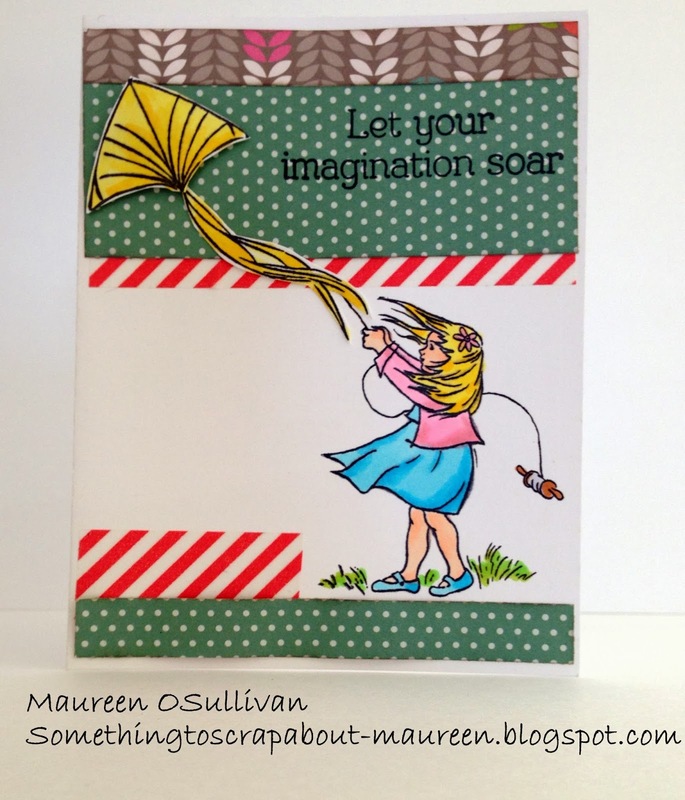 For this card, I was inspired by page 105 of the catalog. The catalog shows this stamp on a scrapbook page. So, I took some of the ideas and created it on a smaller scale. 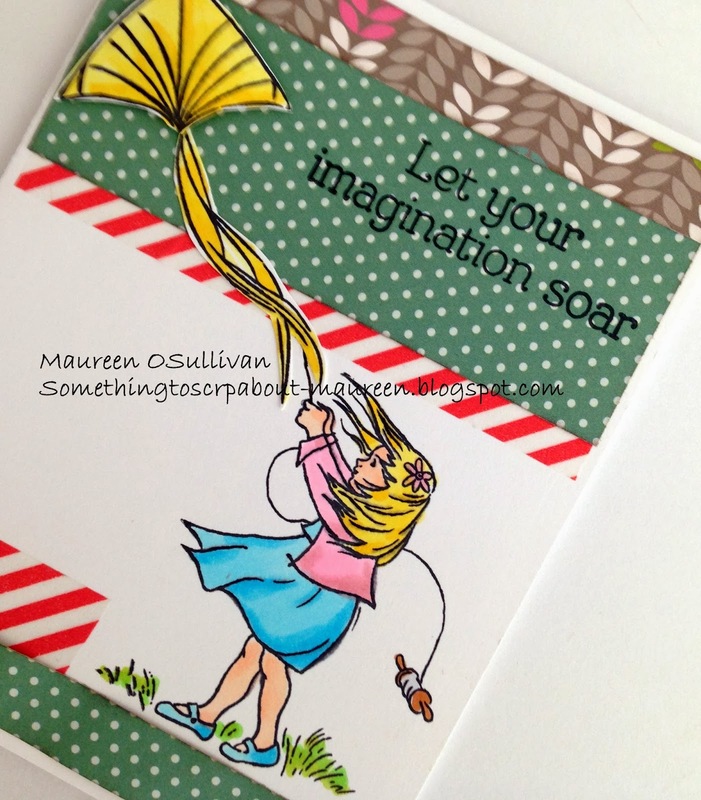 I hope this little card gets you inspired for Spring! Hi, my daughter and I took a trip last year to San Diego. In addition to visiting the Zoo and Sea World, we spent a day at LEGOLAND. If you visit Southern California, then I highly recommend exploring LEGOLAND. Everything is made from Legos-- cities, trees, cars and even Star Wars! 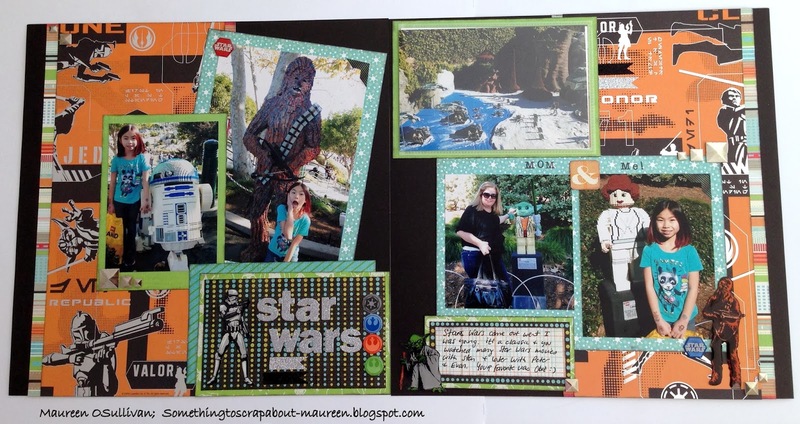 Here is a 2 page LO from the Star Wars display. I made this on Saturday night. The LO did not take me a long time to complete-- maybe 2 hours. I used a sketch (at bottom) and changed it up a bit. I took the only piece of Star Wars paper that I had and matched it up with some Basic Grey paper. It worked! 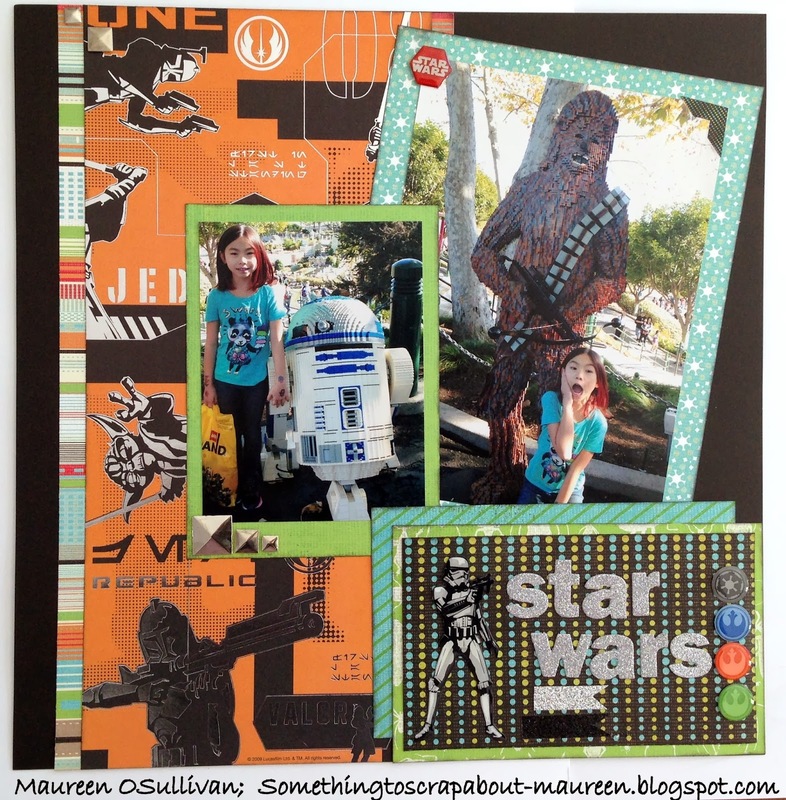 A while back, Abby had picked up some Star Wars Epoxy embellishments. Don't you just love Abby's expression with Chewbacca. Abby is such a character! & Symbols are so in right now. I stamped the words Mom and Me using a CTMH alphabet stamp set. All the edges were inked with CTMH's black ink. Since I had many photos, I threw in a CTMH Flip Flap. 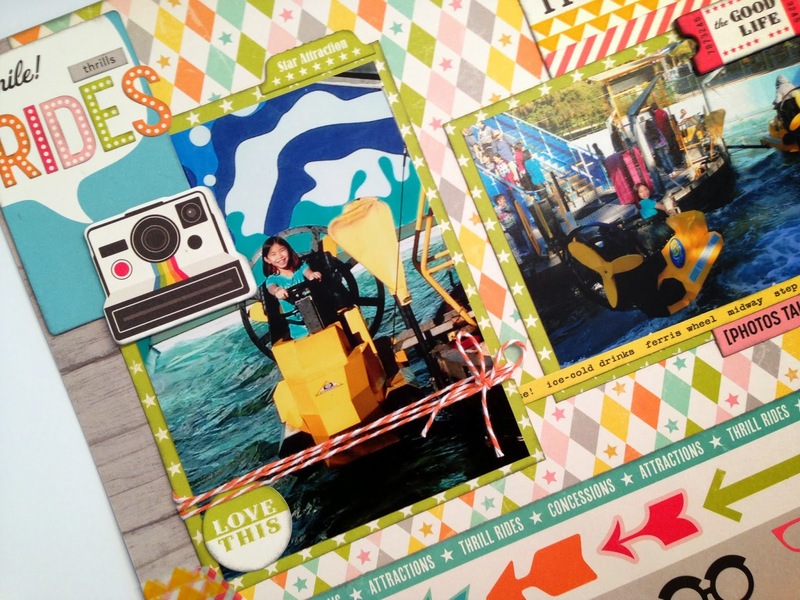 Flip Flaps are ideal when you are doing a trip or project with many photos. 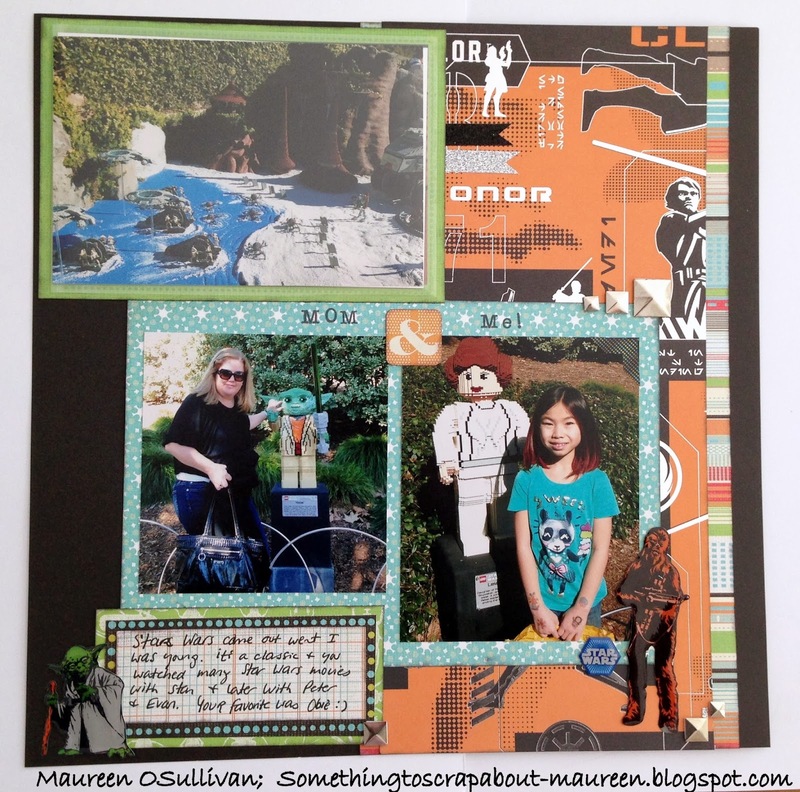 I used a sketch from Scrapbook Generations. I find that when I start to follow a design my creativity just takes off. 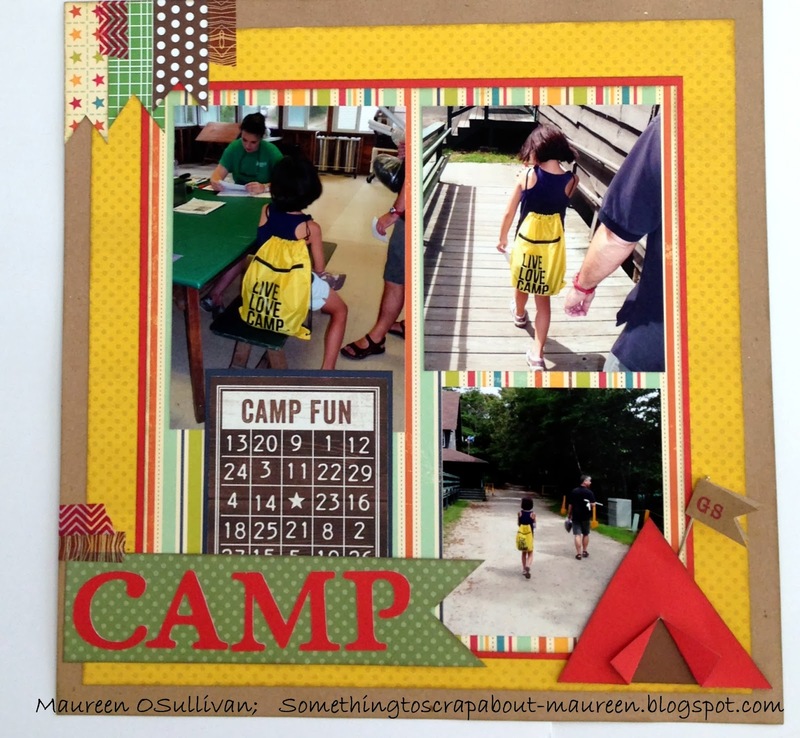 For sketch ideas, I used CTMH's books; along with Scrapbook Generations' design books. Thanks for stopping by. 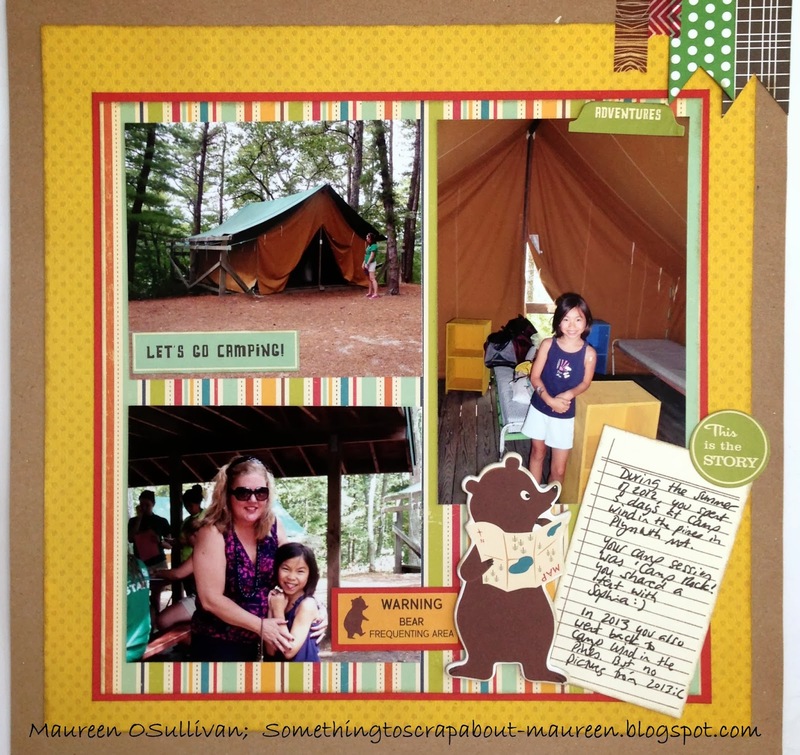 If you liked this LO, please leave a comment because I need a reason to keep blogging! 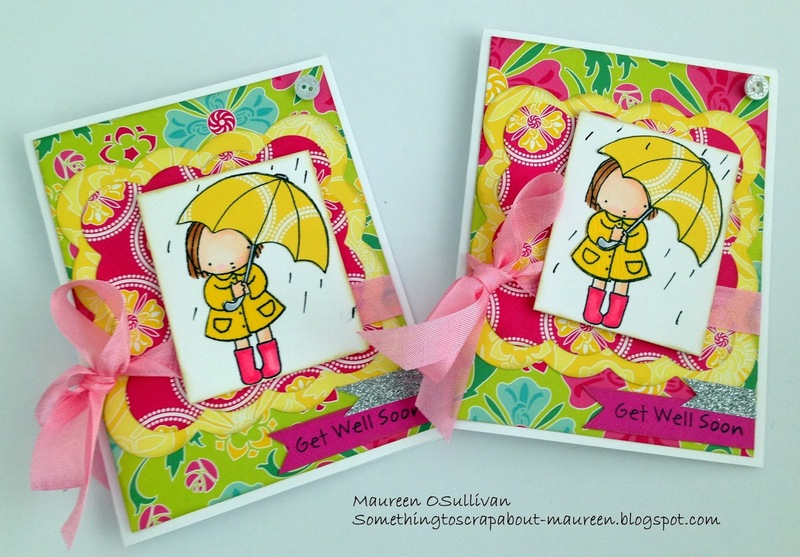 To make the Get Well cards, I used a My Favorite Things (MFT) Pure Innocence (PI) stamp-- My Umbrella. I colored the skin, hair and boots with Copics markers. For the umbrella and rain coat, I paper pieced them. To do this, you stamp the image onto whatever paper you like. The hard part is then cutting it all out and gluing it. But, it is worth it in the end. 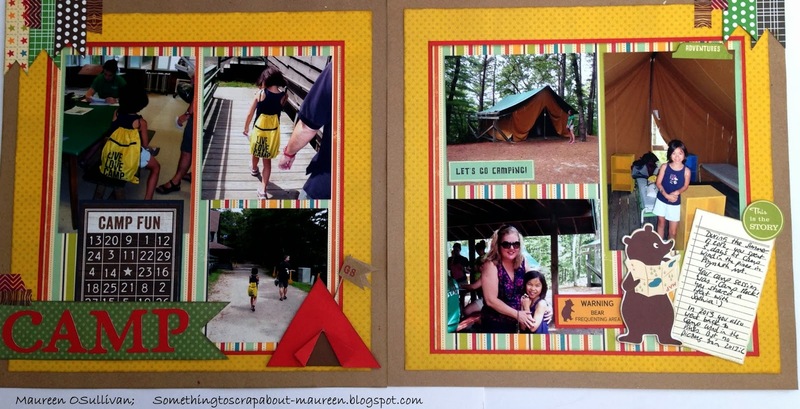 Hi, I've been trying to get caught up scrapbooking Abby's Girl Scouts Camp. 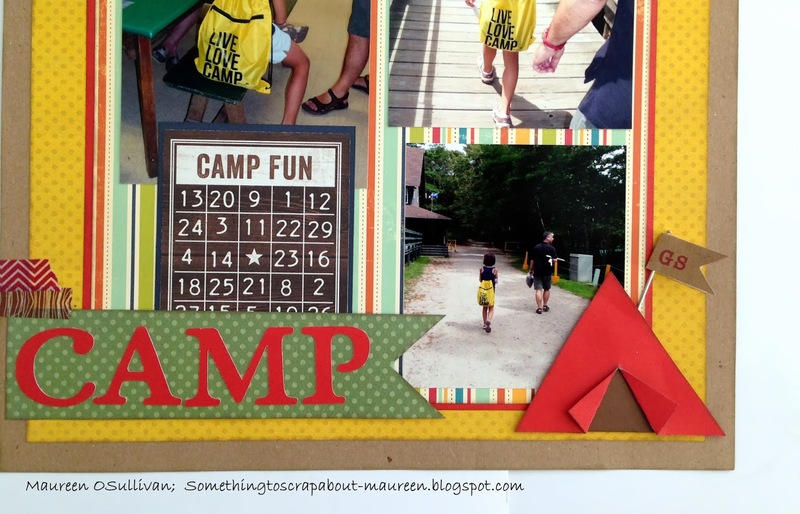 This summer will be her 3rd year at overnight camp. The first year she did one week and then two weeks last year. This year she will go for 3 sessions! Abby just loves Girl Scouts and their summer camps. So, I better get cracking and finish the first year! 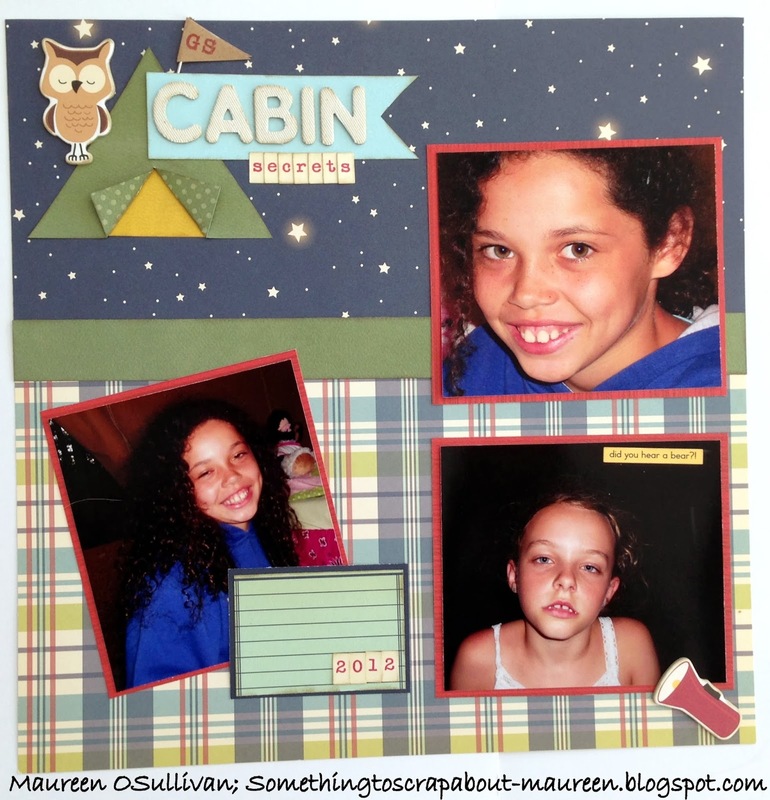 Abby took these photos at night in her cabin. Apparently after the lights went out the girls stayed up to chat a bit. I made another tent. As my other post stated it is super easy! Just make a triangle and the cut from the bottom to ~ 1/2 way up. Next fold back the doors and add some background paper, done! Here's is another 2 page LO that I did a while back. I just needed to add some journaling. 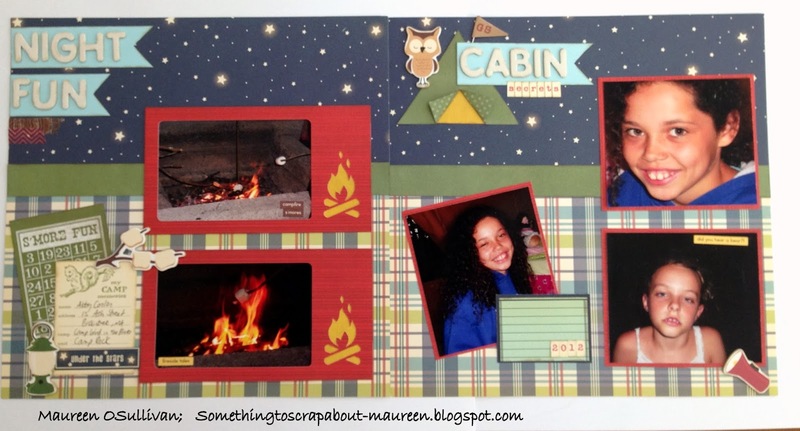 I find journaling to be one of the most important aspects of scrapbooking. It can list the date, event and document how you were feeling, etc. 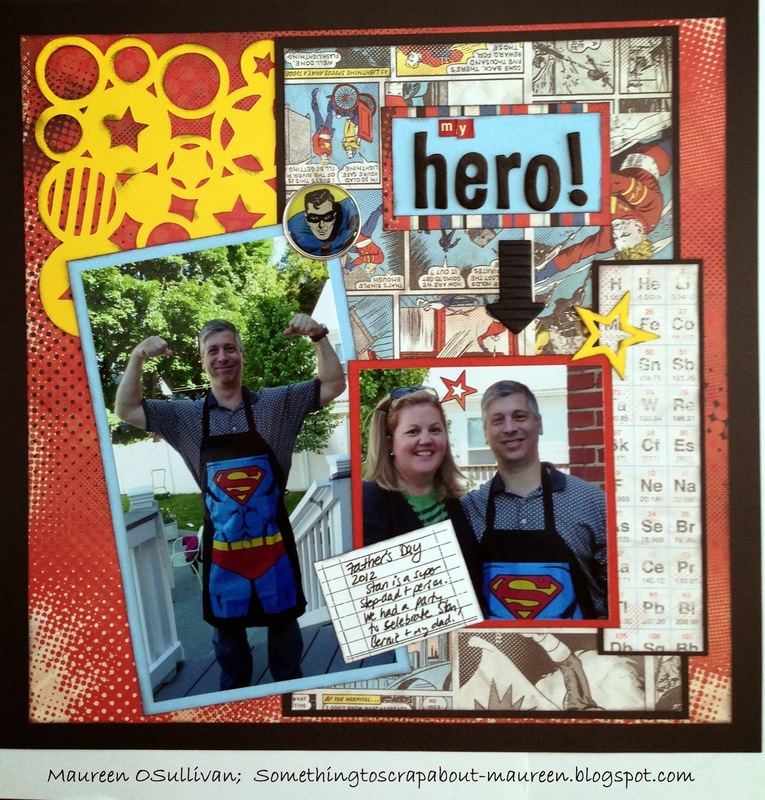 My 'superhero' husband is sometimes critical scrapbooking, at least the time involved. 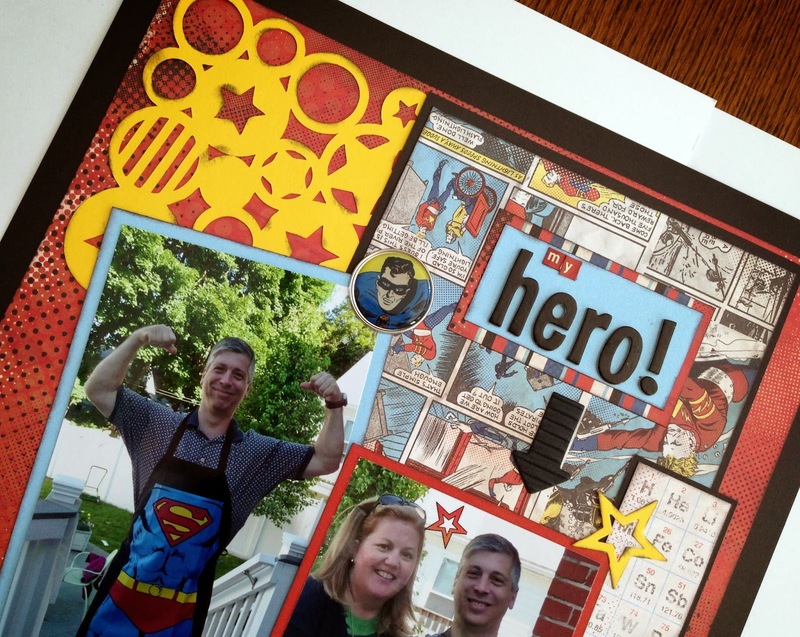 But he learned the hard way about how important scrapbooking can be. Stan travelled a lot in his 20's and 30's and has lots of pictures from China, Hong Kong, Belize and Guatemala. The pictures are absolutely stunning. Just one small problem... he forgets the dates, where he was, etc.!!! Maybe when I have some free time, I'll help him get organized. 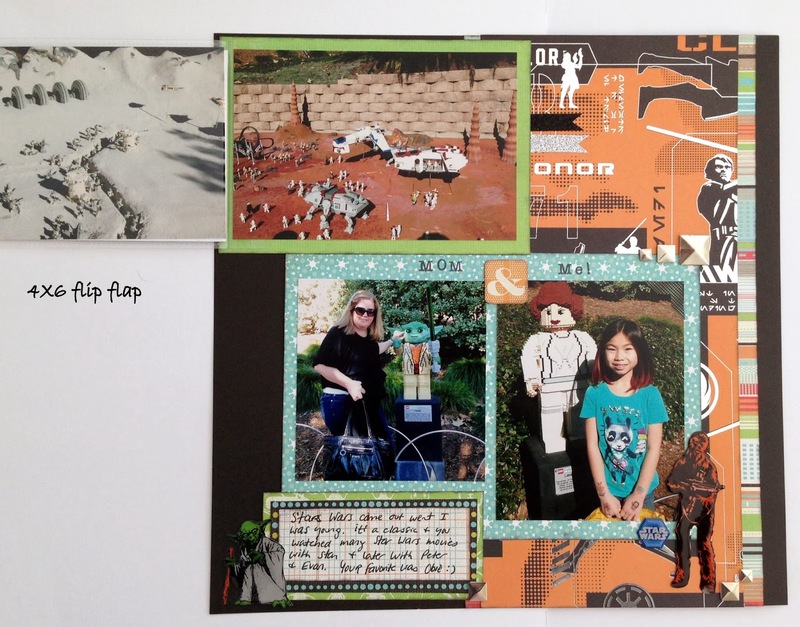 CTMH is now featuring a new line called 'Picture My Life'-- sort of a Project Life type. Their travel line would be fast and quick. 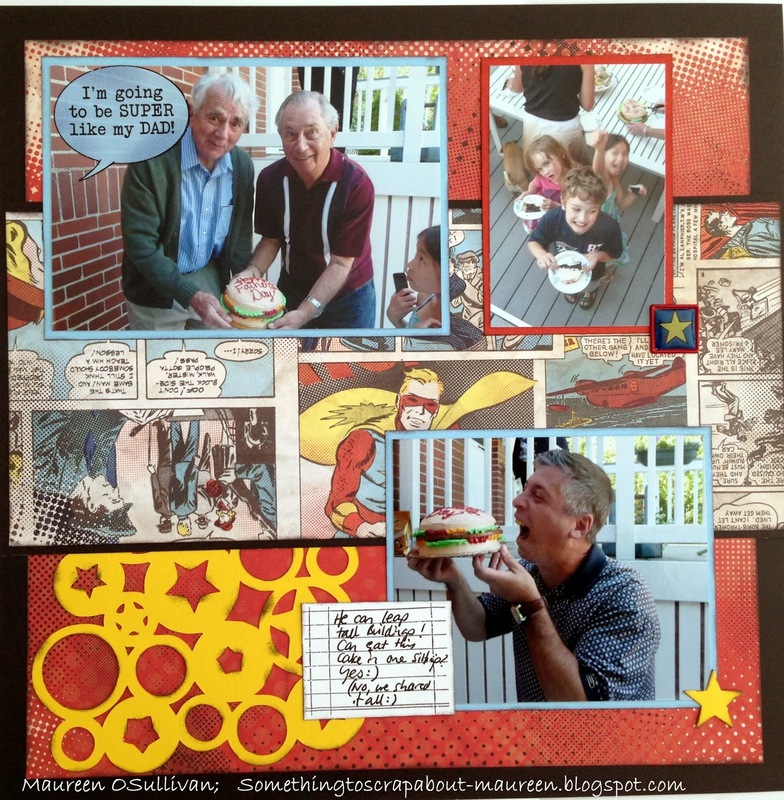 Okay, moving on... here is the LO that I did for Father's Day 2012. My father, along with Stan's dad were guests. This is an event that will forever stay in my mind b/c it was the last time Stan's dad was healthy. Up to the age of 83, Stan's dad walked 4 miles almost every day. Then, shortly after Father's Day, his health started to deteriorate. We later found out that he had stage 4 cancer. Stan's dad (in the maroon shirt) passed away this past January. We miss him dearly. My dad (green sweater) is doing well with his Parkinson's. 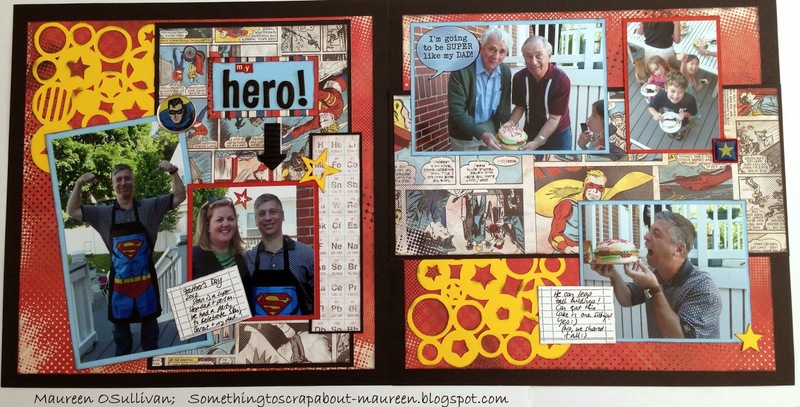 The paper used to create this LO is now retired, 'Super Powers'. 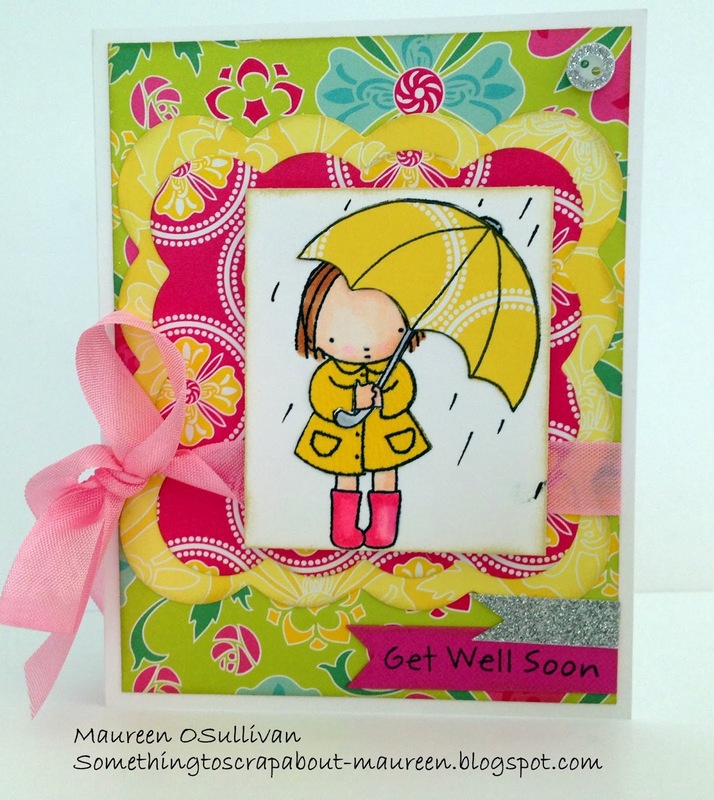 But no need to despair, I have 2 kits left (paper, rub-ons and metal embellishments.) Just email me if you want this set-- mosmojo65@yahoo.com. After all, there are many heroes in our life! Other products used include Artbooking for the yellow circle/star overlay. Inks: CTMH Black. Onto more fun, exciting things... here is a LO that I did back in November at my weekend away. It wasn't quite 100% done, 99.8% done. I had some Maya Road pennants and I thought 'let's make a little Girl Scouts (GS) flag'. I finally was able to do this last night. The snow is a good excuse to chill out in my craft room! To make the tent, I simply cut out a large triangle. Then I made a cut in center from the bottom to ~ half way up. Next, I folded back the opening and backed the tent in another color. Anyway, I did this LO in under one hour. It would have been even less time if I didn't ink all the edges in CTMH's Slate ink. But to me, nothing is complete with out ink. 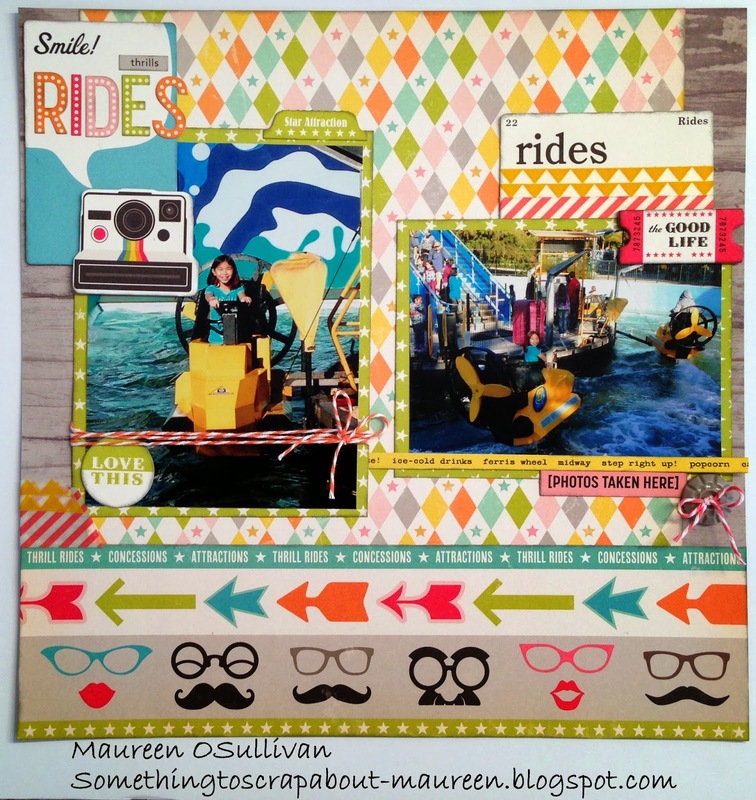 Although all of the paper is from October Afternoon's Midway line, I still used CTMH's washi tape and twine. The pictures were taken from our trip to San Diego in December 2012. We had a great time at LEGOLAND! More pictures to come.